Oil-Electric: "Revolving Picture Collection - 2"
Prince Rupert, 1957. More gems from the "Revolving Picture Collection." As I mentioned in my earlier post, the prospect for me to see a diversity of locomotives was pretty slim living out there on the end of the Prince Rupert Extension! So I began trading pictures of locomotives with pen pals I met through "Trains" and "Railroad" magazine. This provided a great opportunity to learn about different types of locomotives and the railroads they ran on. To illustrate my point, consider the four black and white 5" x 3¼" of heavy Seaboard Air Line Railroad (SAL) power I received through our "Revolving Picture Collection" from Scott Lansing down in Miami Florida. 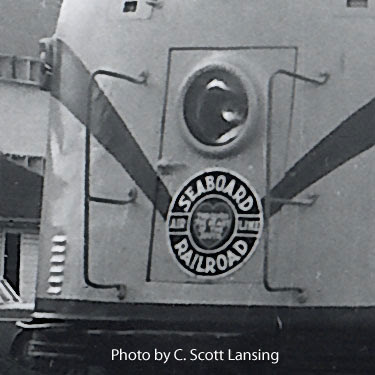 Despite the name, Seaboard Air Line Railroad never "got off the ground." Sales pitches in those days often referred to an "air line" as the shortest direct routing between two points. Similar in usage to "As the crow flies." Photos of SAL "E" units introduced me to the so-called "E" series of passenger locomotives. While "E" designated "Eighteen-hundred horsepower," these twin motor units carried two thousand horsepower. Notice the symbolic Palm and Orange trees? 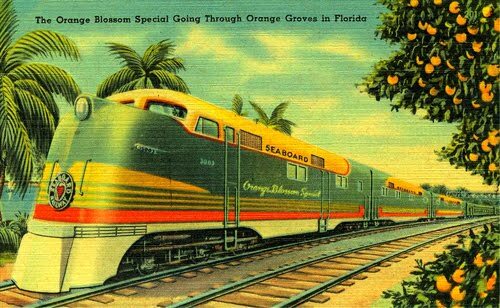 These photos also introduced me to the seasonal migration of the elderly and well to do from the harsh winters of the Northeast to the balmy beaches of South Carolina and Florida on board such posh varnish (passenger trains) as the "Orange Blossom Special." 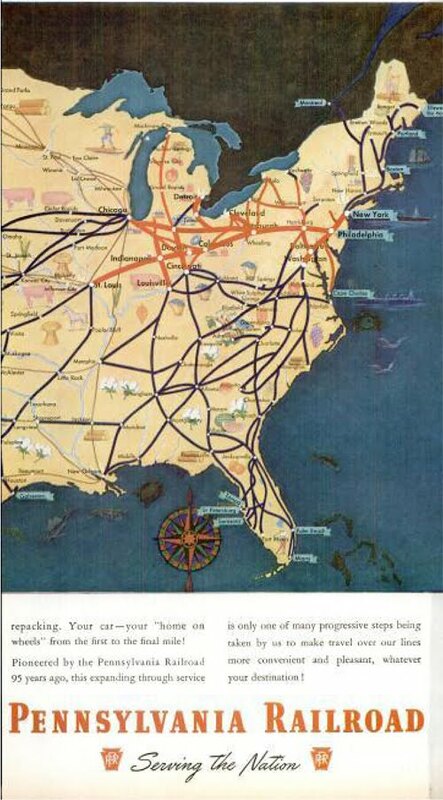 Getting from New York to Miami on the Orange Blossom Special, you left New York on the Pennsylvania Railroad and rode down to Washington DC, where you transferred to the Richmond, Fredericksburg & Potomac. On the R,F&P you journeyed to Richmond Virginia. Finally, in Richmond, you again changed trains, boarding the Seaboard Air Line Railroad to Miami. Hopefully, your baggage made the transfers with you! In addition to the showcase "Orange Blossom Special" which ran year 'round, there were a number of seasonal trains - December through April - to handle peak traffic loads. SAL needed muscle to pull those heavy passenger cars. Once the commitment was made to go diesel, SAL began with a fleet of E-4A's and B's. As a matter of fact, the only EMC E4's built, were built for the Seaboard; 14 "A" units, and 5 "B" units. These units were all Electro Motive Corporation (EMC); engine, generator, traction motors. As you may recall, EMC was purchased and integrated into General Motors Corporation as the Electro Motive Division (EMD) of General Motors on January 1st, 1941. The EMC E4 was simply a modified E3 built to SAL's specification by Electro Motive Corporation (EMC). The most visible alteration is the one-of-a-kind "tilt out" nose door. Looking carefully at the nose, you can see a set of guide rails. The entire front door assembly is hinged across the bottom. The door assembly pivots forward to a vertical position, allowing crew members to make the harrowing transfer from the unit to the train. That would be interesting at 65 miles per hour! 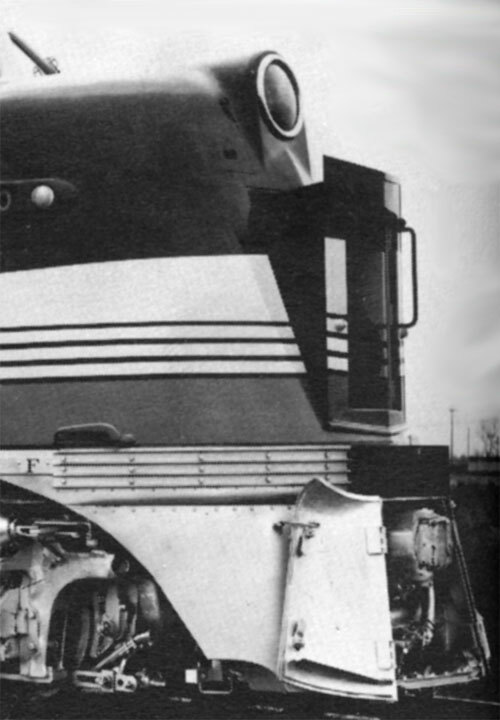 Six years later, Electro Motive Division evolved the passenger line to the model E7. SAL 3017 is an E7A. You can plainly discern the severity of the angled nose was reduced, resulting in the more pleasing so-called "bulldog" nose. I'll be damned if I know how they came up with that nomenclature; I simply fail to see a "bulldog!" Urban legend has it that the less radical "bulldog" nose also improved deflection of automobiles away from, rather than up into the windshield area. That would be important. Seaboard Air Line merged with the Atlantic Coast Line on May 10, 1967, forming Seaboard Coast Line (SCL.) This new railroad would bring together the 5,573 miles of track of the Atlantic with the 4,146 miles of the Seaboard. SAL's unique roof mounted number board! So! 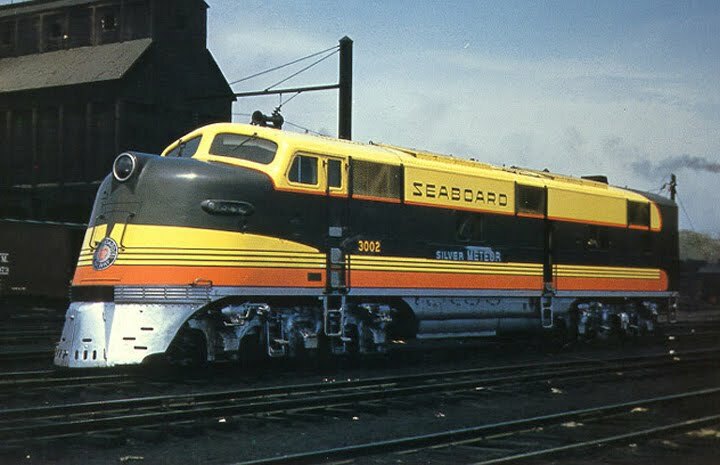 Look at how much I was able to learn about the Seaboard Air Line, and two of its premier locomotives, the EMC E4A, and the EMD E7A. All made possible by simply trading photographs with a "pen pal." Railroad Stuff: SAL 3011, E4A, 2 x EMC 12V-567 1,000 hp. Built by EMC December 1939, Serial Number 964. Retired December 1961. All E4A/B built for SAL. SAL 3017, E7A, 2 x GM 12V-567A 1,000 hp. 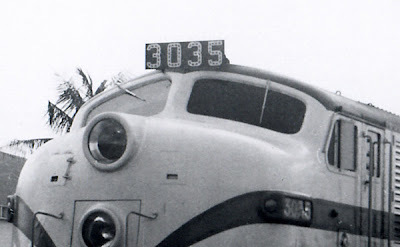 Built EMD March 1945, Serial Number 1929. Became Seaboard Coast Line (SCL) 544, May 1967. Retired September 1972. SAL 3025, E7A. Built EMD 9/45 SN 2879, became SCL 552, May 1967. SAL 3035 E7A. Built EMD 9/46 SN 4444, became SCL 561, May, 1967. There is only one E7A left on planet earth, on display at The Railroad Museum of Pennsylvania.